Rich Crouthers, on board the famous Tennessee Thunder Pro Drag bike (P/D) is seen here in this 2011 file photo warming up his Goodyear prior to a run during the April, 2011, Manufactures Cup Race, held at the SGMSP in Valdosta, Ga. Now that the NHRA and Harley Davidson have made it official, hopefully there will be many such Pro Dragster machines headed for NHRA Divisional races during the 2013 season. Tom McCarthy photo. 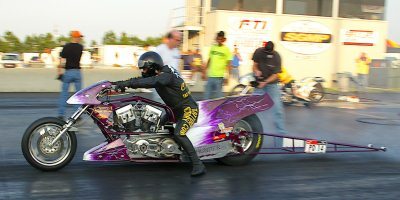 during the new NHRA, Harley Davidson – Drag Racing Series (HD-DRS) events. This is great news for Harley Davidson racing fans world wide and for spectators as well. On the NHRA based web site via this link http://www.nhraracer.com/content/general.asp?articleid=53668&zoneid=175 the latest news on class payouts, entry fees and an official schedule are all now posted on the aforementioned link. Tom. Thanks much for the photo. Now that we have confirmation and the P/D class is part of the NHRA Divisional events it’s time to start working on some of the funding / marketing efforts. See everybody at the races. Tennessee Thunder / Mad Dog racing / Tattoo Factory.